Microsoft® Office has established a position as the most efficient suite of applications for document creation, communication, and business information analysis. For many functions, the business platform has evolved from paper to the Web. Microsoft Office 2000 extends desktop productivity to the Web, streamlining the way you work and making it easier to share, access, and analyze information so you get better results. Office 2000 offers a multitude of new features. Of particular importance for this release are the features that affect the entire suite. These Office-wide, or shared features hold the key to the new realm of functionality enabled by Office 2000. 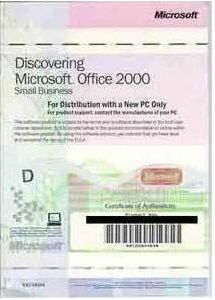 Benefits Office 2000 Small Business also includes small business-specific tools and applications designed for small businesses, such as Microsoft Publisher to easily create marketing materials, as well as a set of four Small Business Tools. These tools were designed for small businesses to help manage and grow customer relationships, make better business decisions, and streamline business operations. Benefits Web-enabled collaboration and information sharing. Office 2000 offers a new Web-productivity work style that integrates core productivity tools with the Web to streamline the process of sharing information and working with others. Rich analysis tools for better decision-making. Office 2000 makes it easier to use an organization’s intranet to access vital business information and provides innovative analysis tools that help users make better, more timely business decisions. Software that is easy to use and manage. Office 2000 delivers new levels of resiliency and intelligence, enabling users and organizations to get up and running quickly, stay working and achieve great results with fewer resources!! This is an OEM Version. You get a Manual with a COA integrated on the Cover. No CD's are included. Multiple-item Copy and Paste function. Up to 12 items can be pasted collectively or individually from its clipboard. Self-repairing utilities fix corrupted or deleted files and repair them for smooth maintenance. File menus can be personalized by assessing which commands are accessed by the user, thereby displaying more frequently used commands on top, and hiding the rarely used ones. File Open and File Save contains a Places bar displaying folders such as Favorites, My Documents and History, in browser-like fashion. Documents can be sent via e-mail, which is integrated within Office 2000. For security measures, digital signatures can be added to Office documents. For the IT junkies, programming with Visual Basic® for Applications and Web scripting with the Microsoft® Script Editor should keep the user tickling the ivories with great satisfaction. Office2000 SBE contains the following applications: Word 2000, Excel 2000, Outlook 2000, Publisher 2000 and the Small Business Tools. Word 2000 stands tall as a word processor. In a technical sense, your writing style may actually improve with the assistance of automation tools, templates and document wizards. Macros can be written and edited for Visual Basic for Applications. Multilingual capabilities are the icing on the cake. Customizable features allow Word 2000 to support editing and displaying documents in over 80 languages. All language versions can detect more than 20 languages and the English version can easily spell and grammar check English, French and Spanish. Office2000 Proofing Tools (an add-on kit sold separately for additional languages) provides for an amazing multilingual environment by incorporating multiple spelling and grammar checkers, in conjunction with the automatic language detector. By doing so, documents can be written in more than one language and edited accordingly. Excel 2000 updates include Euro currency symbol and ISO code standardization. Major advances in HTML file formatting allow Excel files to be published as Web pages by taking advantage of its components (i.e. Spreadsheet, Chart and PivotTable). PivotChart graphically displays data from PivotTable reports. Excel spreadsheets can be e-mailed directly from the program. Importing data is more flexible from other database applications, such as Access 2000, SQL Server and OLAP. Outlook 2000 combines a contact management system with e-mail capabilities. Features include a preview pane, AutoDetect connect, junk e-mail filters and filtered mail merge. For the IT administrators, customizable programming is possible with Visual Basic® for Applications, as well as other component object model add-ins (e.g. C++) to write extensions to Outlook 2000. Trade magazines still rank it behind other notable applications, such as GoldMine or Symantec ACT!, in terms of flexibility and performance. However, for a sole practitioner, Outlook 2000 and its counterpart Outlook Express 5 are easy to use and suitable for your needs. Publisher 2000 is used for creating professional-looking brochures, newsletters and other marketing materials at a fraction of the cost, Publisher 2000 offers improved templates, wizards and color schemes. Publishing can be done from a desktop printer, commercial-printing services or on the Web. New wizards include Quick Publication and Catalog for product catalogs and single-page documents. There are also sixty customizable colour schemes with which to work and commercial printing support (i.e.4-color process separations and spot color). Over 2,000 publication templates, 40 design sets, and a vast assortment of clip art, photographic images and animated GIFs accompany Publisher 2000. Small Business Customer Manager Combines data retrieved from Outlook and accounting data, this application manages customer and financial information in a single database. With the assistance of database wizards and import utilities from accounting software, there is no need to retype repetitive permanent information. Security measures include password protection, three levels of permission access and user logons. In addition, certain tasks can be automated by creating Office documents with pre-designed templates, mail merging and e-mail/fax messaging. Business Planner; The Business Plan Wizard includes articles, visual interviews and detailed outlines for different sections of the business plan. In conjunction with Word and Excel, an effective presentation can be created and modified depending on the target audience (e.g. a financial loan officer or potential investor). Customizable templates and Web links to various business resources complement the program. This tool is a must for any business. Direct Mail Manager: If your client is heavily involved in high volume sales or wants to market a new product, this tool may come in handy. The Direct Mail Manager can produce direct mailing lists and documents by importing address lists from your system. Printing options can be done in-house, or via links to external third parties that offer these services, some at discounted prices. Notable features include online access to mailing list providers, importing various file formats (e.g. Access, Excel, Word, SQL, Outlook), choice of media type (i.e. envelopes, labels, flyers or postcards) and mail merging. Small Business Financial Manager is similar to the Customer Manager, the Small Business Financial Manager uses Excel to create a financial database originating from data imported from accounting software. Reporting wizards lend a great hand to clients who are not well versed in accounting terminology and concepts. Various financial reports include balance sheet, income statement, trial balance, cash flow, sales analysis and ratios. This tool may seem tame to accountants, yet can be a monumental education for your clients by keeping them informed on their financial status. Other reporting functions include industry classifications, key ratio comparisons and growth estimates, as well as assorted wizards (e.g. projection, what-if analysis, buy vs. lease comparisons and customizable charts and graphs). Consult the Help function to see if your accounting software data can be imported.